Just no. You really want me to pick out a single assignment from the repository to blog about? You ds106 professors are cruel and capricious gods (drill instructors?) but fine. FINE. I will comply, if only because you continue to dangle the proverbial carrot of my grade before me. Also because I signed up for this madness and it’s pretty awesome, all things considered. 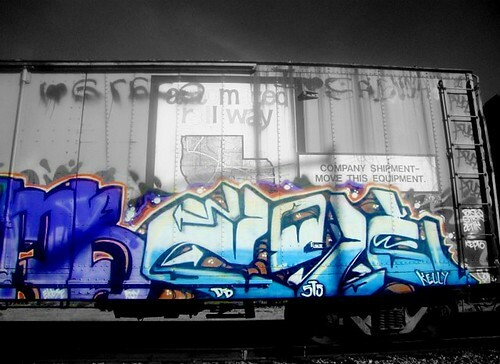 Despite the fact that there is an assignment above that uses kinetic typography, which is my new obsession, I was particularly struck by the Train Graffiti Color Splash assignment. There’s a special place in my heart for graffiti, street art, urban art, all that stuff, and the idea of highlighting the art while dimming the world around it seems kind of magical to me. So often we pass by graffiti without recognizing that it is art, that it’s got a legitimate place in the landscape of creative expression, and consider only the stuff said graffiti is “defacing.” I get that you shouldn’t draw things on other people’s property, but at the same time, have you seen really excellent graffiti? It’s amazing, takes serious talent to do well and often adds a magnificent splash of color to an otherwise dreary urban landscape. In terms of storytelling, this assignment highlights that creativity, forces you to focus on the creation that sits right under our noses or that we might ordinarily dismiss because it doesn’t follow approved avenues of creation. Looking at this photo, I think about the person who created this image, what it means, what is says about them and what it says about its location. The graffiti alters whatever space it’s in, and in giving it the only color in the image, it becomes easy to conceptualize that alteration. This is definitely an assignment I’d like to try my hand at someday. We never limit you to just one, silly rabbit. The first rule of #ds106 club is you can break the first rule of #ds106 club. And yes, you will get to do the Color Splash soon, like next week. It’s one of the interesting ones as almost a creation be deletion (of color).